A second member of the Ivy League coaching family will be stepping down at the end of the 2015-16 season as Penn’s Betty J. Costanza Head Coach of Women’s Track & Field, Tony Tenisci, announced his retirement according to Penn Athletics earlier today. Tenisci has had quite a tenure while at Penn. 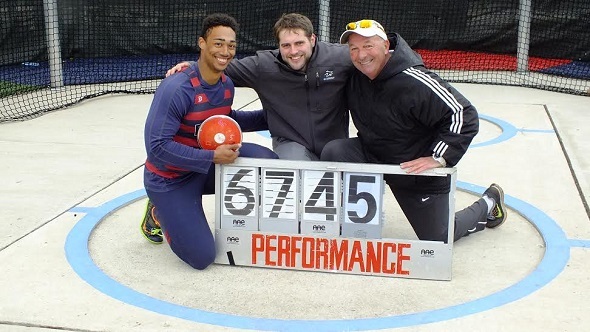 Not only has he developed Penn’s throwing program to “one of the best throwing teams in the east”, he has coached two NCAA champions – Brian Chaput (javelin) in 2003 and Sam Mattis (discus) in 2015 – as well as a number of Heps champions, including three-time javelin champion Kelsey Hay and the first four-time discus champion Mattis. Tenisci came to Penn as an assistant coach in 1986 after serving as the first women’s track & field coach at his alma mater, Washington State University, since 1978. In 2012, Tenisci was named the head coach of the Penn women’s program while still coaching the men’s and women’s coaching programs. He first entered the sport in 1964, where he credits his former coach Willi Krause to bringing him into the fold and essentially “saved my life… so in due turn, I gave my life back to track and field,” Tenisci shared in a tribute about his former coach. Tenisci grew into quite an athlete: four-time All-American and NCAA scorer in the hammer throw for the WSU Cougar, as well as former Canadian national record holder and Team Canada in the event. He is also a former Indoor World Record holder in the hammer in 1971. Tenisci has also contributed to Penn and the sport in other ways. In 1994, he began a campus-wide bodybuilding competition called the Mr. and Ms. Penn bodybuilding competition, which serves as a fundraiser for the Penn’s women track & field program (it should be noted at Mattis won the Mr. Penn title in 2013). In 2013, Tenisci was given the title of Honorary College Field Events Referee for the 119th Penn Relays Carnival. But most widely, he has considered the creator and main developer of women’s hammer throwing in the United States, holding clinics around the country and developing it into the event that it is today. This entry was posted on Tuesday, May 10th, 2016 at 6:58 pm. It is filed under Athletes, Spotlight. You can follow any responses to this entry through the RSS 2.0 feed.